I always try to find unique and original projects when choosing films and shows to watch, for we live in a time where many titles you see out there are sequels, nostalgia reboots or spinoffs. These aren’t bad things per se, but it’s also important to break new ground and produce organic material, something which Netflix has a fairly glowing track record for. Tapping the creative well that is the mind of young female director/actress/producer Brit Marling, the platform has given her the chance to tell one of the most striking, beautiful and altogether astonishing pieces of work I’ve ever seen from the long form storytelling format. Earlier this year, Stranger Things knocked me flat, and recently Westworld has captivated my attention and imagination. But The OA has done something different for me; stirred my soul in a way that few creative pieces can, with a story so unpredictable that it starts to feel like the forces of nature at work, forking off into tributary sections of narrative that you would never, ever have been able to to surmise ahead of the reveals. Now, something I’ll say right off the bat: This won’t be for everyone, and I predict many confused, bitter reviews. Such is the case with work that requires effort and clarity of attention from the viewer, as well as the key ingredient: objective thinking. This is both a scientific and spiritual story, bereft of any religious implicatioms, incredibly vague, esoteric and at times left open to interpretation, or clarification we will get from a second season, fingers crossed. It starts off simply enough, with the return of a girl named Prairie (Marling) to the home she disappeared from seven ears prior. Mysteriously cured of childhood blindness and very secretive of the events which have befallen her, her loving parents (Scott Wilson and Alice Krige in knockout performances) are just happy to see her again. It’s here the story turns off it’s headlights and hurtles blind into the night, going to places you’d never have thought it would, let alone be explored in a mainstream network series. Marling and Co creator Zal Batmanglij (yes that’s his real name) have outdone themselves in the originality department, presenting ideas and questions so far from the norm of what we’re used to that their story really and truly feels unique from anything else we’ve ever seen. Marling is incandescent in the role, which requires her to go to some fairly tricky places in terms of acting, handling it with the shimmering grace of an angel. It’s difficult for me to say anymore because I want you to open up this gift of a story on your own, without anything to go on, but I must mention her co star Jason Isaacs, who plays a scientific man involved in her disappearance. He’s obsessed in a feverish, sick way, and in any other actor’s hands the character may have come across as too villainous or intense. Isaacs is an unheralded genius of the craft though, and despite the callous nature of the role, he seems more human, more grounded than most. I really can’t tell you much more at this point, and what I’ve said so far is much less than I usually do in reviews, as far as plot goes. This is one to binge watch, one to let wash over you like a blanket of stars, and one to think long and deep about as soon as the credits of the last episode make themselves known. 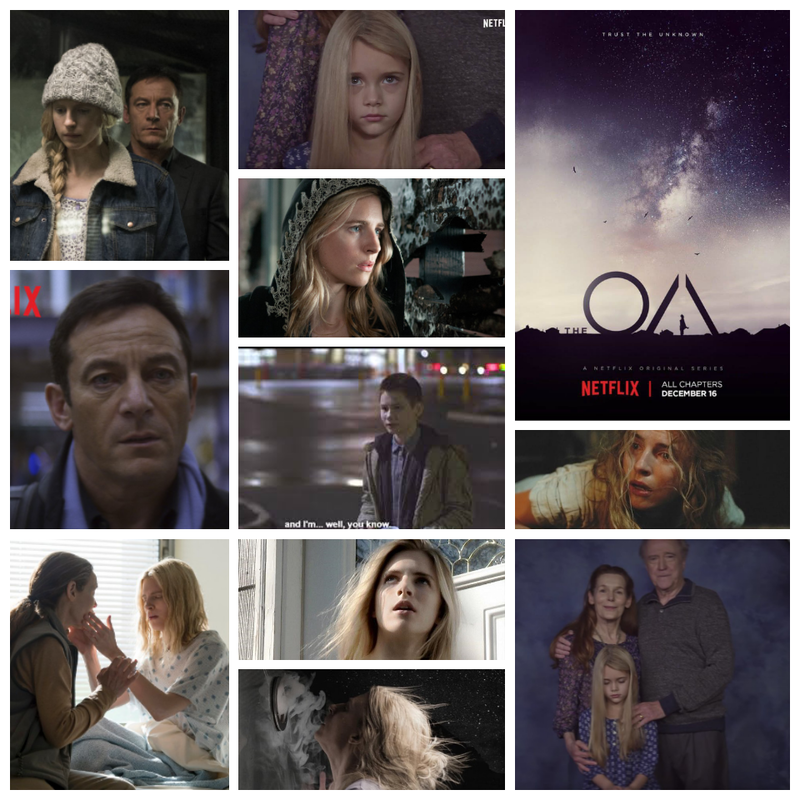 For the thinkers, the wonderers, the ones who ponder what’s out there and what may be in store for us way down the road of the cosmos, The OA is a blast of nutrition for the soul.